Regardless of how near or far you live from the beach, effortless mermaid waves can be achieved in less than five minutes this summer. While these waves are soft and feminine, they allow your hair to be beachy and carefree. Not only will these helpful tips and tricks help you achieve beautiful, natural looking waves, but they will also help you save time on rushed mornings. Braids: Overnight braids are a go-to for summer. Whether you choose to keep the hair out of your face at the beach or keep the braid in overnight for mermaid vibes in the morning, braids are a heatless way to achieve this beachy look without the hassle. For best results, start off with clean, freshly washed hair. Add a small amount of leave-in conditioner and braid until you reach the ends of your hair. Depending on the thickness of your hair and how small you would like the waves, section the hair into 2 equal sections, or skip this step and make one large braid. Get a good night’s rest, and when you take out the braid in the morning you’re ready for a day by the pool! Salt Sprays: The best beach waves are the ones you get after a long day of swimming in the ocean and letting it dry in the beachy breeze. Get this exact look without the sandy hair by creating your own salt spray at home! Although you can buy salt sprays that are already made, keep things easy and affordable by mixing 1 cup of warm water with 1 tbsp.of sea salt and 1 tbsp.of coconut oil. Keep this mixture in a spray bottle and spray in anytime to achieve effortless waves! Straightener Technique: Forget to braid your hair the night before? To achieve a neater, more perfect wave, add this straightener technique to your morning routine! Start off with dry, knot-free hair. Apply your straightener to the root of your hair and slowly drag it down a small section of hair. Turn the straightener towards the ceiling until the piece of hair is upside down and hold. Release and continue with the entire section of hair. Repeat this until all hair is a perfect wave. Curling Iron: There is no better look for a summer wedding than soft loose waves! If you would like more control with your waves or need a quick style for a summer BBQ, look no further! For this look, grab a curling iron with the barrel size of your choice. For looser, more effortless waves, go for a bigger barrel and separate hair into larger sections. For small, more beachy waves, grab a smaller barrel such as a 1-inch iron. Wrap each section around the barrel and hold for 15-20 seconds. Repeat on each section of hair and lock it in with your favorite hairspray! For a softer, more voluminous look, brush waves lightly with a wide tooth comb! 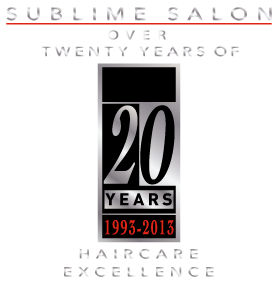 Check out more tips and tricks to achieving beachy waves by contacting Sublime Salon today!